GOLD AND BLACK ILLUSTRATED VOLUME 28, ISSUE 6 29 he still could deliver pounding blows at that weight while increasing his change-of-direction quickness. It's a combination that could make an already dynam- ic back even more dangerous. "I want to go out with a bang my senior year," Jones said. "It's kind of hard to believe I'm about to be a senior. I think it's (about) leaving no regrets. Maybe in the past some nicks and bruises have kept me out from a practice or whatever and you tend to start to feel sorry for yourself. But there's no more time for that. Who knows if I'll have a chance at the next lev- el? It really could be my last year playing football. So I just have to leave it all on the field. I've heard a lot of guys say that in the past and I really never under- stood what it meant. But as every day goes by, you really do start to realize it's really a dwindling time. "It's a blessing I've been able to have some of the success I've had, but I think if I'm able to stay healthy, I could really achieve some more goals. I'm looking forward to seeing what happens." Knox was the only top back that was able to go start- to-finish last season — though he did need thumb surgery before the bowl game — and his presence was instrumental in the bowl game victory, in which he totaled 137 all-purpose yards and scored a TD. Really, 2017 was vintage Knox: Taking advantage of every opportunity presented. Though he got 23 few- er carries than Jones, he still nearly led the team in rushing by averaging a team-best (among backs) 6.2 yards per carry. His 15 catches also led the RB room. He had a key blitz pick-up, too, on the game-winning touchdown pass in the Foster Farms Bowl, giving Sindelar an extra second to release the ball to Antho- ny Mahoungou. 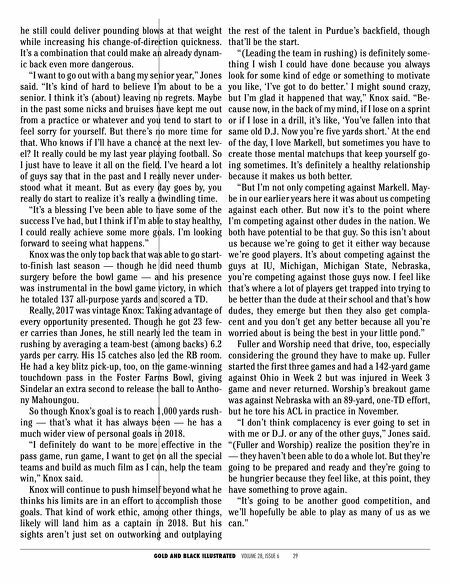 So though Knox's goal is to reach 1,000 yards rush- ing — that's what it has always been — he has a much wider view of personal goals in 2018. "I definitely do want to be more effective in the pass game, run game, I want to get on all the special teams and build as much film as I can, help the team win," Knox said. Knox will continue to push himself beyond what he thinks his limits are in an effort to accomplish those goals. That kind of work ethic, among other things, likely will land him as a captain in 2018. 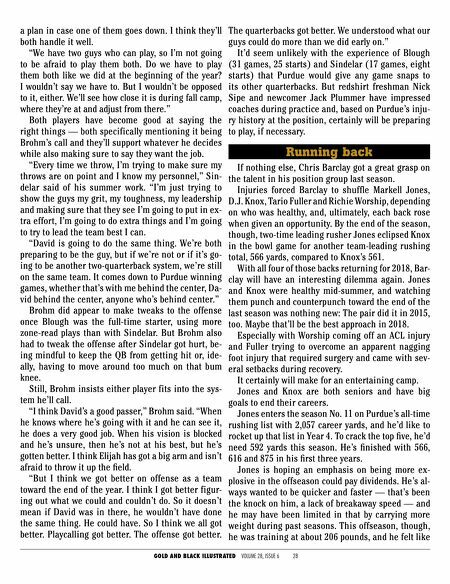 But his sights aren't just set on outworking and outplaying the rest of the talent in Purdue's backfield, though that'll be the start. "(Leading the team in rushing) is definitely some- thing I wish I could have done because you always look for some kind of edge or something to motivate you like, 'I've got to do better.' I might sound crazy, but I'm glad it happened that way," Knox said. "Be- cause now, in the back of my mind, if I lose on a sprint or if I lose in a drill, it's like, 'You've fallen into that same old D.J. Now you're five yards short.' At the end of the day, I love Markell, but sometimes you have to create those mental matchups that keep yourself go- ing sometimes. It's definitely a healthy relationship because it makes us both better. "But I'm not only competing against Markell. May- be in our earlier years here it was about us competing against each other. But now it's to the point where I'm competing against other dudes in the nation. We both have potential to be that guy. So this isn't about us because we're going to get it either way because we're good players. It's about competing against the guys at IU, Michigan, Michigan State, Nebraska, you're competing against those guys now. I feel like that's where a lot of players get trapped into trying to be better than the dude at their school and that's how dudes, they emerge but then they also get compla- cent and you don't get any better because all you're worried about is being the best in your little pond." Fuller and Worship need that drive, too, especially considering the ground they have to make up. Fuller started the first three games and had a 142-yard game against Ohio in Week 2 but was injured in Week 3 game and never returned. Worship's breakout game was against Nebraska with an 89-yard, one-TD effort, but he tore his ACL in practice in November. "I don't think complacency is ever going to set in with me or D.J. or any of the other guys," Jones said. "(Fuller and Worship) realize the position they're in — they haven't been able to do a whole lot. But they're going to be prepared and ready and they're going to be hungrier because they feel like, at this point, they have something to prove again. "It's going to be another good competition, and we'll hopefully be able to play as many of us as we can."